I’d imagine that a lot of Oregon Duck fans probably stopped paying attention to the NFL Draft after Marcus Mariota went No. 2 to the Tennessee Titans. Maybe a few of us toughed it out through the 17th pick when Arik Armstead went to the San Francisco 49ers. Being an NFL junkie, I continued to follow all the picks, particularly to see where all the Ducks in the draft would go. 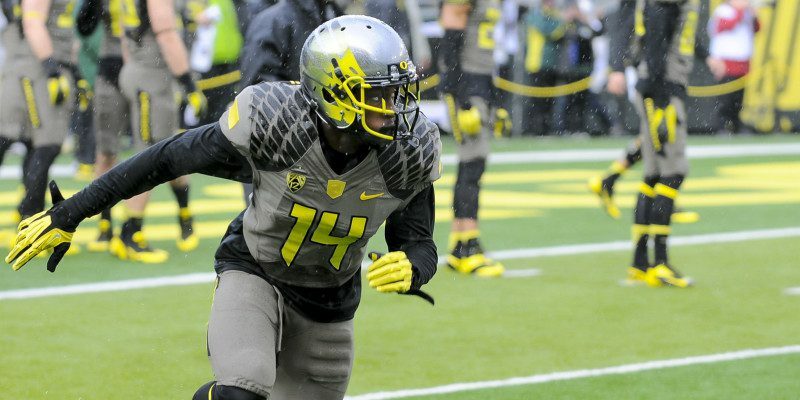 After a quick look at each player and which team they wound up with, it seems that former Duck, Ifo Ekpre-Olomu, going to the Cleveland Browns in the 7th round, could be the best fit for his new team out of any Duck in the draft. Despite his late-season injury, Ekpre-Olomu is now on an NFL roster. 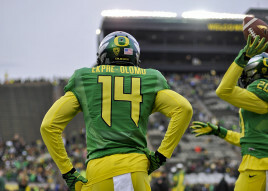 While some other critics may rant on how well Mariota fits with the Titans or how Armstead is the perfect fit for the 49ers defense — Ekpre-Olomu is truly the perfect fit for the Browns. Even though he didn’t go until the 7th round — the last of the draft — Ekpre-Olomu has the chance to be a starter. Farmer went on to say that he fully expects Ekpre-Olomu to recover by saying, “We felt like we were getting the right kind of guy that we knew had talent … ” then added “He suffered an unfortunate injury. We are confident he will get healthy.” Although he has the endorsement of the Browns GM, Ekpre-Olomu’s ACL tear being so late in the season begs one to question if he will be able to play as a rookie. 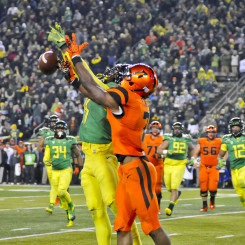 A talented ball hawk, Ekpre-Olomu is clearly a 1st-round talent. Regardless of how long it will take him to return to the game, Ekpre-Olomu will be a participating member for one of the best NFL starting secondaries. His size and tenacity is also comparable to Cleveland’s all-star cornerback, Joe Haden. Having the opportunity to learn from one of the best players in the game will certainly help him adjust to the professional level. Along with being a good fit for the team and in a city where people believe in him, Ekpre-Olomu will have something most 7th-round picks don’t have — $3 million. An aggressive corner who excels in press coverage, Ekpre-Olomu is a natural fit for the Browns defense. Even though this policy normally costs the insured person — in this case, Ekpre-Olomu — $40,000 annually, the Oregon Ducks have been paying this on his behalf. This is another one of those weird loopholes in the NCAA’s policies, as it is legal and Oregon isn’t the only school to buy policies for their student athletes. Might I add, buying a student athlete an insurance policy is legal but somehow buying him or her a sandwich is not. Now, Oregon also had policies for Mariota, Armstead, DeForrest Buckner, and Hroniss Grasu according to Rovell’s article. 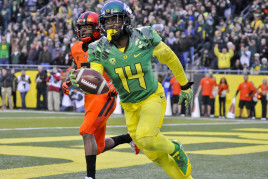 In the end, despite a torn ACL is considered to be bad luck, Ifo Ekpre-Olomu has the best luck of any Oregon player. He is the 7th-round pick for a team where he best fits the scheme they run, which means there is almost no pressure on him to perform immediately. Moreover, he will get $3 million to soften the blow of falling to the 7th round — surely seems like Ifo has some luck on his side.